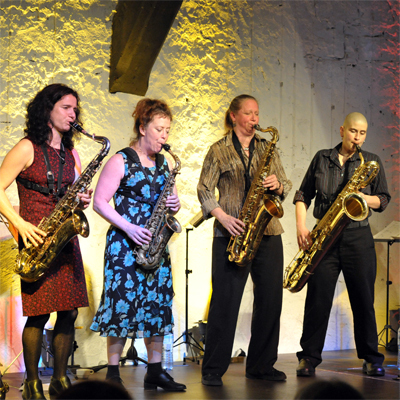 "The Tiptons Sax Quartet" is a jazz saxophone quartet from Seattle, Washington. They actually consist of five members (the fifth member being the quartet's drummer and percussionist). The name of the quartet was inspired by Billy Tipton, a jazz pianist and saxophonist, who upon his death was revealed to be anatomically female. Formed in 1988, they have toured frequently in North America and Europe. Stockfisch-Shop Please note: There are still some parts to be translated into English. So what’s the cause of this driving beat? What trail is being blazed on this LIVE SACD which virtually obliges one to turn the volume up LOUD at the risk of attracting complaints from the neighbours? THE TIPTONS from Seattle, USA. These are Amy Denio, Jessica Lurie, Tobi Stone, Sue Orfield and Elizabeth Pupo-Walker. Elements of swing, klezmer, big band, pop and Eastern European nuances interwoven with occasional strains of gypsy music are blended together to craft that ultimate, inimitable TIPTONS’ sound. Four Saxophones plus percussion. SFR 357.4034.2 • total time 49:20 • Sorry, out of print! On the Super Audio CD (SACD) the sound is recorded in DSD (Direct Stream Digital) format. The sampling frequency (2.8224 MHz) is 64 times that of a traditional CD. Furthermore, DSD uses 1-bit quantization. With the aid of this technology an even broader frequency range (up to 100 kHz) and even greater dynamics (120 dB) can be achieved over the entire useful audio range. Until now it was practically impossible to maintain the DSD format throughout the entire edit/mix/mastering sequence during production. This was because no system is yet available which permitted the necessary processing in the 1-bit format after a DSD recording. This meant that the unavoidable editing procedures such as gain leveling, mixing, cross-fades or even additional EQing or dynamics processing could be achieved only by downconverting to PCM format (i.e. the Pulse Code Modulation format of the traditional CD). We first used our SADiE DSD8 system for the recording, processing and mastering of this DIRECT-CUT-SUPER-AUDIO-CD – which enabled us to forget about the limitations that had beset us to date: a brand-new system from the tradition-steeped British manufacturer of mastering equipment that allows simultaneous recording of 8 channels. The analogue signal from the microphone is converted at the input to DSD and is also maintained in DSD-Wide format with 2,8224 MHz throughout the processing stages already mentioned. The end result is then obtained in the SADiE DSD8 – the "cutting master" (AIT tape) – which is then transferred directly to an SACD glass master in the pressing plant. This DIRECT-CUT-SUPER-AUDIO-CD will enable you to hear a 5.1 DSD surround mix as well as a DSD stereo mix on the SACD layer, and the 16-bit PCM stereo program on the hybrid layer which guarantees downward compatibility. So this gives you the first ever opportunity of comparing a real(!) DSD recording with the conventional CD format. The microphones used were: six UM-75 valve microphones by Neumann/Gefell and two Neumann TLM- 50s. In the sketch you can see the positioning of these during the live recording. A GRACE mic-pre delivered the necessary line level to the SADiE DSD8 converter. We have quite intentionally done without artificial reverb, the 5.1 mix traces the microphone positions in a distinct and direct manner. As a result, the multichannel version sounds breathtakingly live and three-dimensional – the listener is, so to speak, "surrounded by horns". In the U.S.A. this SACD was reviewed as "multichannel disc of the month at Audiophile Audition" "multichannel disc of the month at Audiophile Audition"! Our Hybrid-SACDs include a 16bit hybrid layer and can therefore be played on any CD-Player! • SACD stereo sound requires SACD player for playback. • SACD Surround sound requires multi-channel SACD player and compatible surround sound system for playback.